Shroob Castle is the corrupted version of Princess Peach's Castle after it was taken over by Shroobs. 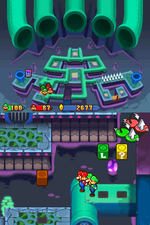 It is the setting of the final chapter in Mario & Luigi: Partners in Time. 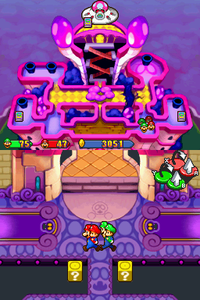 The Save Album calls it Peach's Castle (Past), even when Princess Shroob has complete control over it. The castle towers are changed into tall purple mushrooms, along with all the pillars and bushes. The castle itself glows purple. Inside, a lot of the castle seems the same as the original, only darker, with the Shroob emblem and more violet in coloration. The map resembles the one of the future castle. Glowing purple mushrooms grow all over and a giant statue of the castle's ruler, Princess Shroob, can also be found here. Shroob UFOs fly around the exterior of the castle. Beneath the castle is an underground cellar, and unlike the Shroob castle, it has the same music from the cellars in the original castle. It has a few enemies, most of them being Shroobsworth, Shroob Rex and Soul Bubbles. A regular Chain Chomp pesters Mario, Luigi, Baby Mario and Baby Luigi here as well. Mushroom (x5) In the right ? Block in the north of the northeast room on the second floor. (x3) In the middle ? Block in the east of the telescreen room on the third floor. (x4) In the ? Block in the east of the second scene in the statue. In the ? Block in the SE of the first scene in the first cellar area. Super Mushroom (x3) In the north ? Block in the right of the small room in the NE of the southernmost room on the first floor. (x4) In the left ? Block in the north of the northeast room (where used to be Princess Peach's) on the second floor. (x7) In the SE ? Block in the highest opening on the second floor. (x4) In the ? Block in the west of the second scene in the statue. Ultra Mushroom (x2) In the left ? Block in the southwest of the southwesternmost room on the first floor. (x2) In the right ? Block in the NW of the library on the second floor. (x4) In the red block in the northeast of the second scene in the statue. (x2) In the ? Block in the center of the fifth scene in the first cellar area. Max Mushroom (x2) In the red block aboe the SE ledge in the southeasternmost room on the first floor. (x3) In the green block in the northwest of the second scene in the statue. Mushroom Drop (x5) In the green block in the SW of the third scene in the statue. Super Drop (x2) In the left ? Block in the NW of the first scene on the third floor. (x4) In the red block in the SE of the third scene in the statue. Ultra Drop (x3) In the red block in the NW trunk of the room to the south of the entrance of the first floor. In the right ? Block in the south of the northwesternmost room on the first floor. (x3) In the green block in the NW of the third scene in the statue. 1-Up Mushroom In the south ? Block in the secret area to the east of the northeast room with a pipe on the first floor. (x2) In the right ? Block in the high high area above the NE ledge in the west open area on the first floor. In the ? Block in the SW of the first scene in the first cellar area. 1-Up Super (x2) In the right green block in the SW trunk of the room to the south of the entrance of the first floor. In the ? Block in the NW of the west long room on the first floor. (x2) In the right green block in the NW area to the southwesternmost room on the first floor. In the ? Block above the SE desk in the library on the second floor. (x2) In the red block in the SE of the second scene on the third floor. Refreshing Herb (x2) In the ? Block in the south of the spiky room to the back of the center scene in the outside area. (x2) In the left ? Block in the high area above the NW ledge in the east open room on the first floor. (x3) In the ? Block in the east of the bridge on the second floor. (x2) In the right ? Block in the NE of the south area of the second scene in the second cellar area. Red Pepper (x2) In the left ? Block in the northeast of the center scene in the outside area. (x2) In the left ? Block in the pipe area of the outside area. (x2) In the ? Block in the center trunk of the room to the south of the entrance of the first floor. (x2) In the middle ? Block in the high area above the NW ledge in the east open room on the first floor. (x3) In the right ? Block in the NE of the library on the second floor. Green Pepper (x2) In the middle ? Block in the high area above the NE ledge in the west open area on the first floor. (x3) In the left ? Block in the NE of the library on the second floor. (x2) In the right ? Block in the southernmost scene in the second cellar area. Green Shell (x3) In the right ? Block in the south of the east scene on the third floor. Red Shell (x2) In the ? Block in the north of the spiky room to the back of the center scene in the outside area. (x3) In the left ? Block in the south of the northwesternmost room on the first floor. (x3) In the SW ? Block in the right of the small room in the NE of the southernmost room on the first floor. (x3) In the left ? Block in the NW area to the southwesternmost room on the first floor. (x3) In the north ? Block on the platform above the stairs on the third floor. (x3) In the left ? Block in the east ledge in the fourth scene in the first cellar area. Trampoline (x3) In the left ? Block in the south of the southwestern big room on the first floor. (x3) In the southeast ? Block on the platform above the stairs on the third floor. Bro Flower (x3) In the southeast ? Block in the north of the east area outside. (x3) In the left ? Block in the south of the east scene on the third floor. Copy Flower (x2) In the right ? Block in the northeast of the center scene in the outside area. (x2) In the right ? Block in the pipe area of the outside area. (x2) In the ? Block in the northwest of the room to the south of the entrance of the first floor. (x3) In the ? Block in the south of the room to the south of the entrance of the first floor. (x3) In the northwest ? Block on the platform above the stairs on the third floor. Ice Flower (x3) In the ? Block in the SW of the room to the west of the library room on the second floor. (x3) In the southwest ? Block on the platform above the stairs on the third floor. Mix Flower (x2) In the left ? Block in the south of the room to the east of the library room on the second floor. (x2) In the left ? Block in the SW of the telescreen room on the third floor. (x3) In the northeast ? Block on the platform above the stairs on the third floor. (x4) In the ? Block in the SW of the third scene in the first cellar area. (x2) In the NW ? Block in the fifth scene in the first cellar area. Smash Egg (x3) In the right ? Block in the south of the southwestern big room on the first floor. (x3) In the ? Block in the NW of the east scene on the third floor. Pocket Chomp (x3) In the ? Block above the SW platform in the library on the second floor. (x2) In the right ? Block in the south of the room to the east of the library room on the second floor. (x3) In the south ? Block on the platform above the stairs on the third floor. (x2) In the ? Block in the SE of the third scene in the first cellar area. Cannonballer (x3) In the ? Block in the NE of the east scene on the third floor. Dire-Free Badge In the left red block in the NE trunk of the room to the south of the entrance of the first floor. Lucky Badge A In the left green block in the NE of the south area of the second scene in the second cellar area. Rocket Jeans In the NE red block in the secret area to the east of the northeast room with a pipe on the first floor. In the green block in the NE of the underground area of the second scene in the second cellar area. Space Trousers In the SE red block in the right of the small room in the NE of the southernmost room on the first floor. In the green block above a platform in the back room of the third scene in the first cellar area. Bean In the center of the west long room on the first floor. In the center of the east long room on the first floor. In the small room behind the northernmost room on the first floor. In the first stair of the small room in the NE of the southernmost room on the first floor. In the fourth stair of the small room in the NE of the southernmost room on the first floor. In the small room behind the northwesternmost room on the first floor. In the lower area to the south of the east entrance of the second floor. In the lower area to the south of the west entrance of the second floor. In the south of the room to the west of the library room on the second floor. Three beans can be found in the south of the room to the east of the library room on the second floor. Two beans can be found in the south balcony on the third floor. The four scenes in the north of the second cellar area each has a bean at the center. This page was last edited on March 24, 2019, at 09:18.